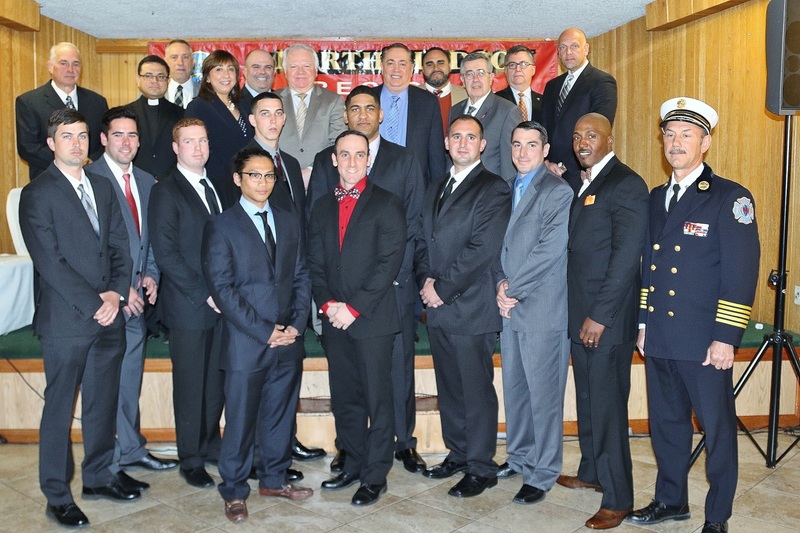 North Hudson Regional Fire and Rescue officially welcomed ten new probationary firefighters and promoted six experienced fire officers at a ceremony recently held at Schuetzen Park Banquet Hall in North Bergen. The new recruits will be attending the Morris County Fire Academy and are expected to begin their service to NHRFR by early July. They will join 75 others hired over the past few years including 65 military veterans, helping to enhance public safety in the NHRFR coverage municipalities of North Bergen, Union City, West New York, Weehawken and Guttenberg and surrounding areas. The promoted officers and their new positions are Deputy Chief Michael Falco, Battalion Chief Daniel Fresse, Captain Terrence Shevlin, Captain Richard Barreres, Captain William Reid and Captain William Shelton. The new probationary firefighters are John Dolaghan, Jerry Zapata, Michael Conroy, Lou Jester Isip, Glen Harvey, Robert Manzari, Vincent Vassallo, Koi Kirk, Thomas McDonough and Keith Sockell. With dozens of proud family members in attendance and local elected leaders looking on, North Hudson Regional Fire and Rescue officially swore in ten new firefighters and promoted one to Captain at a ceremony today. All ten of the new hires are military veterans who served our country in Iraq and Afghanistan, and now they will have the opportunity to continue putting the training, leadership and skills they developed in the armed forces to great use in protecting families throughout North Hudson from fires and other emergencies. The ceremony was held in North Bergen at the Schuetzen Park Casino Room and was attended by mayors and representatives of each of the five towns NHRFR serves. These ten new firefighters join 55 veterans who have been hired by NHRFR over the past two years. The Regional has a firm commitment to employing military veterans, who come to the job with the strongest possible experience in following a command structure and bravely putting their lives on the line in order to protect others. The new firefighters have all completed training at the Bergen County Fire Academy and are now on the job. In addition to the new hires, Firefighter Markus Rehfeld was promoted to the rank of Captain. 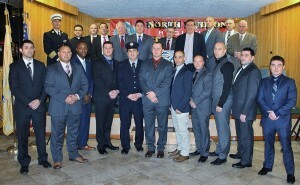 The new firefighters are Gary E. Colombo, Marcin Cymek, Howard X. Intriago, Godson Noel, Fabrizio Alessandri, Luis A. Mejia, Edgardo Feliciano, Herbert Martinez, Roberto Villanueva, Jr. and Radoslaw Krol. In addition to Mayor Turner, elected officials at the ceremony included North Bergen Mayor and State Senator Nick Sacco, West New York Mayor Felix Roque, Guttenberg Mayor Gerald Drasheff and Hudson County Freeholder-elect Anthony Vainieri. The event was also attended by NHRFR Board members Chris Pianese of North Bergen, Union City member Martin Martinetti, West New York member Ruben Vargas, Executive Directors Mike DeOrio and Jeff Welz, Deputy Chief Charles Thomas, Deputy Chief David Donnaruma, Captain Matthew Caliente, several members of the department’s command and supervisory staff and dozens of proud family and friends. 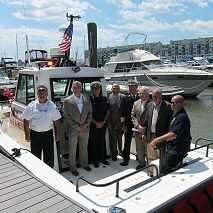 North Hudson Regional Fire and Rescue (NHRFR) officially launched the new 38-foot ‘Marine 1’ Fire Boat on July 8 at the NY Waterway Ferry Terminal in Weehawken. The purchase of the vessel, funded by federal grants, will further enhance NHRFR’s rescue capabilities along the Hudson County Waterfront and expand its mission as a Homeland Security first responder. The Regional’s water rescue response was famously called into action in 2009, when NHRFR firefighters captained the first rescue vessel to respond to the US Airways Flight 1549 water landing by Captain “Sully” Sullenberger. 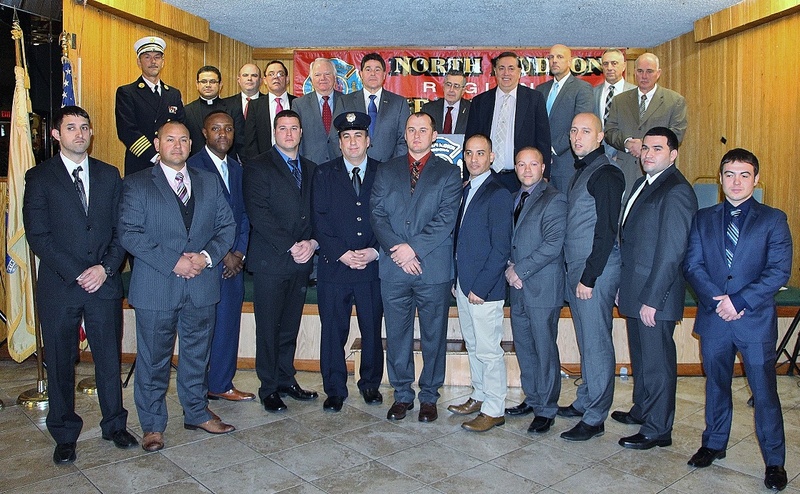 Family, friends and government dignitaries were on hand to celebrate the recent promotion of nine North Hudson Regional Fire and Rescue firefighters to the rank of Captain. Additionally, the Regional promoted former Captain Daniel DeOrio to the rank of Battalion Chief. 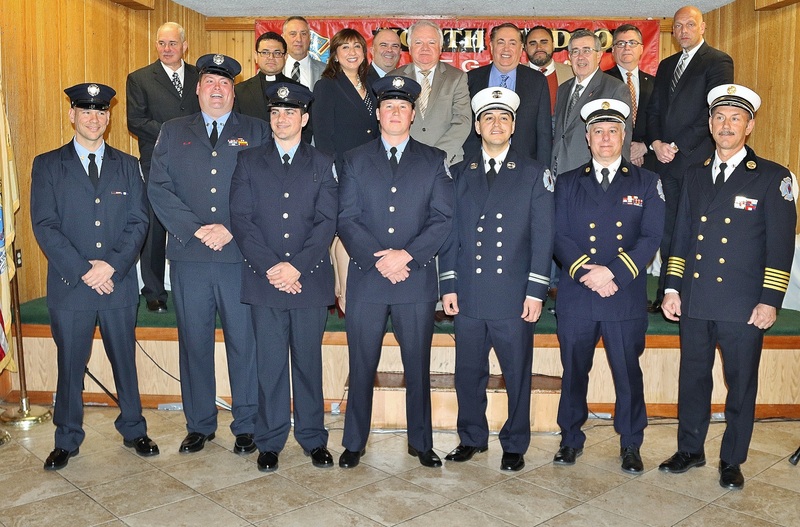 Back Row: North Hudson Regional Fire and Rescue Board Member Ruben Vargas, North Hudson Regional Fire and Rescue Board Secretary Martin Martinetti, Guttenberg Mayor and North Hudson Regional Fire and Rescue Board Member Gerald R. Drasheff, Co-Director Mike DeOrio, Mayor Nicholas J. Sacco, Weehawken Mayor and North Hudson Regional Fire and Rescue Chairman Richard Turner, North Hudson Regional Fire and Rescue Vice Chairman Chris Pianese and Co-Director Jeff Welz. 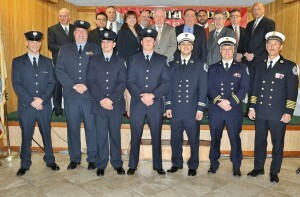 Front Row: Captain Richard DeSimone, Captain Matthew Caliente, Captain Michael Crossan, Captain Michael Alvarado, Captain Thomas Van Leuven, Captain Carlos Perez, Captain David Lacarrubba, Captain Steven Wojtowicz, Captain Jose Ramos, Battalion Chief Daniel DeOrio, and North Hudson Regional Fire and Rescue Chief Frank Montagne. Nightly News with Brian Williams profiled NHRFR’s hiring of 30 new firefighters who are all United States Veterans, including those who have served in Iraq and Afghanistan. As members of the uniformed services, they immediately understand the chain of command and the type of structure the Regional operates under, while their dedication to serving their country and communities singles these candidates out as assets to the department. Mayor Felix Roque, a NHRFR Board Member, joined members of North Hudson Regional Fire & Rescue as they presented a fire safety program to fourth graders at PS#2 in West New York. 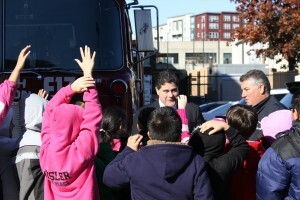 NHRFR brought their fire safety trailer to schools in North Bergen, Union City, West New York, Weehawken and Guttenberg as part of Fire Prevention Month. 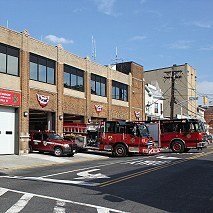 North Hudson Regional Fire & Rescue is now operating a new, state-of-the-art, double firehouse at 4300 Kennedy Blvd. in Union City. The firehouse will also house the Regional’s fire dispatch center (fire control), emergency operating center and its emergency and interoperability command center, which will enable NHRFR to link with surrounding emergency networks in the case of a major disaster or terrorist incident. Representatives from the New Jersey Division of Fire Safety visited NHRFR headquarters in West New York to donate of hundreds of fire detectors for residents of Guttenberg, North Bergen, Union City, Weehawken and West New York. The smoke detectors have been distributed to residents, specifically focusing on senior citizens, lower-income residents and households with children. After nearly 30 years of service, Frank Montagne has become the first North Bergen native to become chief of North Hudson Regional Fire and Rescue (NHRFR). Frank was sworn in by North Bergen Mayor Nicholas J. Sacco as NHRFR’s fifth chief after receiving the highest possible civil service score. 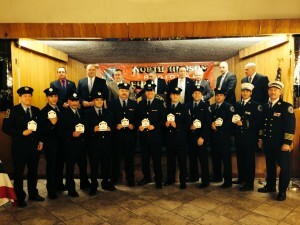 Chief Montagne then had the honor to swear in seven additional firefighters who were promoted to the rank of Captain. 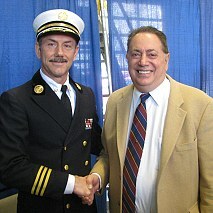 Battalion Chief Robert Duane, Co-Director Mike DeOrio, Deputy Chief David Donnarumma, Board Secretary Martin Martinetti, Chief Frank Montagne, Weehawken Mayor and NHRFR Chairman Richard Turner, Co-Director Jeff Welz and Retired Captain Keith Gonyow, were on hand to launch NHRFR’s new 27-foot ‘Marine 2’ Fire Boat earlier this year. A quick response, all-weather vessel with a top speed of more than 50 mph, ‘Marine 2’ has a 3-liter, 130-horsepower, Mercury inboard engine, coupled with a Darley fire pump that can put out 1,150 gallons of water per minute – in addition to the latest navigational equipment and a range of 250 nautical miles.